Mike Potter has done it again--this time in the guise of Captain Nemo. So much goes on in Nautilus it's hard to know just where to begin. If you are familiar with Protector you will be reminded of it when playing Nautilus. Many facets of game play are similar, including a scrolling "microworld" several screens wide, and cities of steel and glass. Potter has developed an imaginative, storytelling style, and it is gaining in scope. There are two independently scrolling screens in Nautilus. 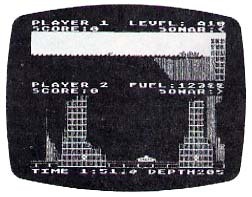 The top screen maps the progress of Colossus, the destroyer that constantly ferries repair teams across the microworld sea. It is armed with depth charges and heat seeking missiles, and can move at high speed. Among other dangers, the captain of the Colossus must remain wary of helicopter air attack. The bottom screen maps the position of Nautilus, the malicious, energy-starved submarine. The Nautilus is armed with unlimited torpedoes, which are very handy--for the sea is filled with dangers. Besides the depth charges and smart missiles dispatched from Colossus, the deep is populated by limpet lurkers, dastardly and unrelenting smart mines. They lock on the course of the Nautilus, and maintain pursuit. It takes up to five direct torpedo hits to put one out of commission. The goal of play for the commander of the Nautilus is to destroy underwater cities. In the cores of these cities reside the proto-pods which must be captured to replenish the voracious batteries of the sub. Meanwhile, upstairs, the Colossus transports underwater repair crews to the rescue. On its way, it positions itself over the Nautilus, and unleashes a deadly mix of missiles and depth charges. It continues then to the western shore to drop off its crew. The crew will work its way eastward, repairing destroyed cities as it does. If the Nautilus remains in proximity to a city under repair, it will be destroyed. It therefore becomes a priority to keep the Colossus from ever reaching the western shore. The captain orders Nautilus to the surface, and steers it into shallows where there are no smart mines. Here it lies in ambush, in hopes of damaging Colossus enough to force it back to the eastern port. The dual screen approach is unique, and allows the positions of both ships to be depicted simultaneously, even though they may be as many as five screens removed from one another. Sonar aboard each ship indicates the relative position of the other. When their screen locations coincide, the command console flashes red. The ships can repair themselves as many times as necessary, but repairs cost precious time. The Nautilus must be careful not to so much as graze any solid surface--she goes down if she does. This makes navigation of the many underwater caverns a tricky business. Nautilus can be played by two players, one at the helm of the Colossus, the other of Nautilus, or as a solitaire game, with the computer controlling the destroyer. Length of the game is selectable from three to nine minutes. There are nine skill levels, as well as the option to energize energy core transformers, gates throughout the sea, making the game extremely hazardous. This mode is not for beginners. There is a handicapping option as well. Nautilus is a tour de force. The opening music is excellent, and hints at a context for the game--the tune is "Volga Boatmen." The really appealing thing about the game, as in its predecessor Protector, is the creation of a microworld; in this case an undersea world, full of secret grottos and hidden dangers. The fine-scrolling graphics capabilities of the Atari are used to their fullest potential. Nautilus is another must from Synapse Software. I do have a complaint, and though it is a small one, it is persistent. Allow me to appeal not only to Mr. Potter, but to all game designers with this plea: please include a pause feature in your games! Do it with the space bar, the escape key, CONTROL-I, SELECT; I don't care how, but please do it. It should be noted that the lack of such a feature becomes evident not only when the phone rings, but when it comes time for us to take pictures of a program for inclusion in a review such as this one. Pause or no pause, Nautilus is addictive and a lot of fun. I recommend it very highly.